So . . . I was cleaning out some drawers not to long ago and I came across this little gem. It's the very first quiet book I ever made. I can't believe I had completely forgotten about it! When I was in college I took a course from Camille Fronk Olsen called Women in Scripture (I know, I know--if you know Camille then you're pretty jealous of me :) She is an amazing teacher and it was an amazing class. I learned so much. A large portion of our grade in the class was determined by a big semester project of our choosing having to do with women in scripture. I chose to make a quiet book for children teaching about these amazing women. Looking back I find my choice funny. I must really have some sort of crazy love for quiet books. The book includes verses directly from the scriptures along with a picture/activity page. Having studied child development I tried to include all that fun sensory stuff for kids. I also did a lot of research into the verses I included in the book and made a guide for parents so they could help their children better understand some of the unfamiliar parts of the scripture. For example on the page about Miriam it says in Exodus 2:3, "And when she could no longer hide him, she took for him an ark of bulrushes, and daubed it with slime and with a pitch, and put the child therein; and she laid it in the flags by the rivers brink." My parents guide explains: The precise form of this little "ark" is unknown. It may have been a basket, a boat, or a box. It was made of leaf of the papyrus, a reedy plant which grew plentifully on the banks of the Nile, and which was used by the Egyptians for cordage, baskets, boats, sails, writing material, and a variety of other purposes; even sometimes food. The "slime" . . . though melting easily and running freely, when cold it is very brittle; but if mixes with tar it becomes tenacious when set, and makes firm cement. In preparing the little vessel for the reception of the infant Moses, it is probable that the papyrus leaves were first plaited together, and then coated with a mixture of hot bitumen and tar, which when cold became firm and water-proof. Interesting, huh? Yeah, this little guide is full of interesting facts and tid-bits. It's such a little treasure to go along with my quiet book. So to be honest I'm kind of embarrassed of this book. The idea and the research I put into it are fabulous--but the art and construction of it . . . it's not . . . perfect. I was a poor college student and had super limited supplies (and time). It really was quite painful to my budget to have to go out and buy all those brushes and different colors of paint. I still have to remind myself that no little kid is really going to care. My kids love this book and have so much fun learning the scripture stories as they play with the pages. In fact this post has taken me forever to write up because each time they see me working on it they are reminded of this little quiet book and they want me to read it with them. Regardless of what a little child might think though I'm still hesitant to share it here . . . but I'm going to anyway. I hope it will inspire someone to make something 10 times better than mine, and more importantly help their children develop a love for the scriptures and the lessons that we can learn there . . . and fortunately these small picture hide so many of my many flaws. First off is my little cover page. All the text in my book was done by typing it up on the computer and then printing it out onto Pellon Peltex sheets through my printer. Printing onto the Pellon mutes the text quite a bit. I used black ink but you can see it comes out looking more gray. The apples are felt and removable with velcro. There is also velcro in Adam and Eve's hands so they can hold the apple. On this page the fuzzy sheep can be moved around to different velcro spots on the page. Here's Moses floating in his reed basket on the "ric-rac" water. The basket opens and Moses is removable. I just have to say pellon is really a pain to paint--especially with cheap brushes. I tried to take a short cut and used a permanent marker to do some of the coloring. You can see on the opposite page that over time some of the green marker has bled over. I'm a little sad about that . . . but what are ya gonna do? Here is the page with the basket closed. On this page Ruth's arm is movable with a brad. Her hand is holding a string that the stalks of wheat can be strung onto. The stalks of wheat are held a in pocket that looks like a bundle of wheat. On this page the barrel can be seen with a small amount of meal on the bottom. Then as you tell the story the child can unbutton the barrel and turn it over . . .
to show the jar full. Esters hair can be braided and tied with the ribbons. Baby Jesus and the little land can be removed and placed on the page with velcro. On this page the woman's hair is made of string that can be used to clean/wipe the Savior's feet. So as you can see this book is a great teaching tool and has become a real treasure. 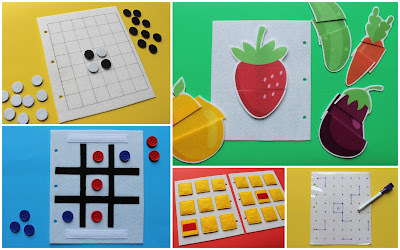 I hope it inspires you to create a fun teaching tool for your children. Looking for more quiet book ideas? 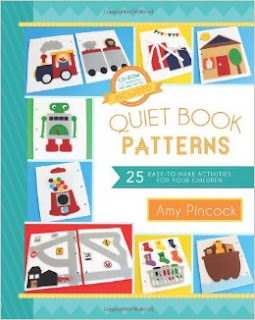 Check out my other quiet book patterns below. I hope you got an A+! This is so creative and inspiring.